Curious about the new Dell Medical School? Please join us on November 3rd from 5:30-7:30pm to hear from Dr. Clay Johnston (HMS '92), Inaugural Dean of Dell Medical School. We will meet at the Texas State Capitol in the Members' Lounge (E2.1002), located on the bottom floor of the underground Capitol Extension. Light refreshments will be served at 5:30pm, with Dr. Johnston's talk starting promptly at 6pm. After a short break to allow our guest speaker and others to take their leave, the business meeting for the Harvard Club of Austin will begin. Please email Karen Kim at austinharvard.org@gmail.com to RSVP for this event, as space may be limited, and please include the names of guests in your party. Parking is available at the Capitol Visitors Parking Garage at 1201 San Jacinto, which is free for the first 2 hours, and $1 for each half hour thereafter. 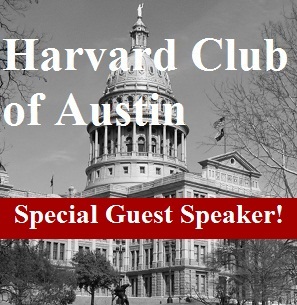 This event will also serve as Harvard Club of Austin's Annual Meeting.